To bring the full AV experience to big spaces at a lower total cost of ownership (TCO), BenQ will introduce two new additions to its high-brightness projector lineup. The SH963 and SX914 projectors shine at 6,000 lumens of dual-lamp power with extra-sharp XGA resolution (SX914). The full HD 1080p models feature high contrast ratios of 50,000:1, detail-enhancing HQV processors, big zoom capabilities, horizontal/vertical lens shifting, 2D keystone correction, and throw ratios of up to 2.43 to decrease setup time and enable more efficient presentations. With a number of connectivity options including dual HDMI, these projectors deliver enhanced picture quality to any of today's conference room or lecture hall environments. BenQ will also present new lines of business projectors at InfoComm 2013. With the M5 projector series, small and medium spaces benefit from an improved contrast ratio of 13,000:1, up to 6,500-hour lamp life, and support for 3D Blu-ray players via HDMI and NVIDIA 3DTV Play. The M6 series further augments the value proposition by providing up to 3,500 ANSI lumens of brightness, wireless connectivity options, incredible image quality, color longevity, mobile device integration, hassle-free maintenance and security, and PC-less presentation using USB drives. 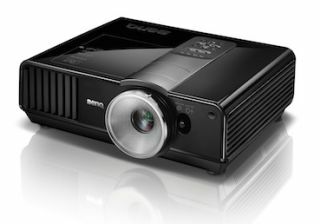 For the total projection package, BenQ's new M7 Series shines 4,200 ANSI lumens of brightness, provides LAN control for easy maintenance, and introduces new thoughtful innovations such as USB camera integration, remote desktop capabilities, wireless display options for cable-free connections, and projection templates to make presentations even easier. Also making its debut at InfoComm 2013 is the new MX661 projector, which features BenQ's newest version of QPresenter software and app and supports PC-less presentations. Last but not least, BenQ is unveiling its 3D solutions with a built-in 5GHz wireless full HD 1080p projector. Designed mainly for home theater settings, the new W1500 projects uncompressed full HD images from sources such as Blu-ray and DVD players, AV-R players, set-top boxes, and gaming consoles without the need for HDMI cables. The unit also enables mobile device integration for easy wireless connectivity with an Apple TV or iPad.